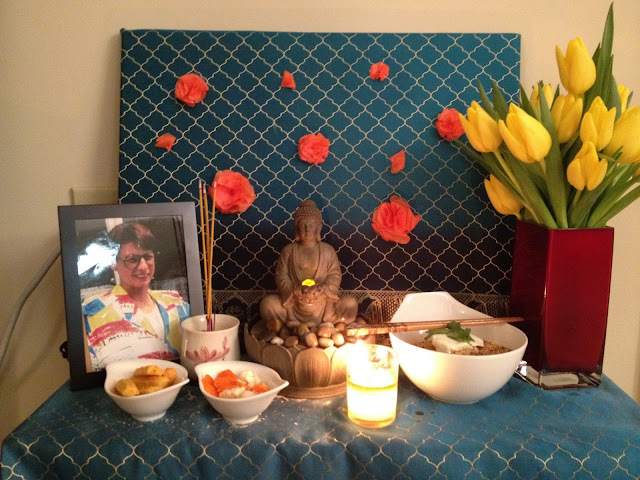 I gerry-rig an ancestor altar every year since I met my Beloved, whose mother is passed, but since I fell into a Buddha statue at Target this weekend, this year required a better backdrop than Renter's Ecru. Some altars have Buddha before a generic sunny sky, but my scene is a particular dark night. When Buddha was about to find enlightenment beneath the bodhi tree, the demons of desire and evil aimed arrows, rocks, and fire at him to disrupt his quest, but the weapons fell softly around him as flowers. Electrical outlets were also a part of Buddha's ancient landscape. Watch Enlightenment, part 2 on PBS. See more from The Buddha. 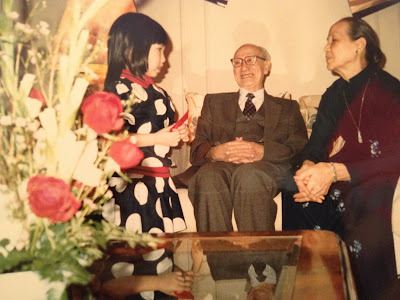 Whether it's history or legend, I'll take the lesson in equanimity wherever I can get it. Thich Nhat Hanh defines equanimity as "nonattachment, nondiscrimination, even-mindedness, or letting go." In this year of the water dragon, may we all not discriminate between the fire and the flowers. Let them fall. May we unattach ourselves from the past. The present awaits. May we let go, and let the sun rise. These are my wishes for a happy new year. Love this post, Ivy. I keep running into Thich Nhat Hanh in my own practice! Love the photo of you as well.